The Fiskars 28-inch chopping axe is a popular axe. If your current axe is in a state anything like mine (with a particularly blunt blade and loose handle) then you’re probably on the lookout for a new one. So I thought I’d do a little research to make sure I brought the right one this time. The most important part of an axe is its head. It needs to be made from good quality steel (you can replace the handle if it’s shoddy, but not the steel). It also needs to be sharp enough to get a good cutting edge (thin enough eat into the wood, but thick enough so it doesn’t get chipped as it cuts). This is a fine balance that not many axes have. This feature stood out. It is also one that other reviewers constantly mention and I can see why. I probably sound like a stuck record, but the importance of an axe’s head cannot be underestimated. The Fiskars 28 Inch Chopping Axe comes with a forged steel blade and this means a few things. Firstly, it stays sharper for longer, letting you can cut more trees compared to a traditional axe. Secondly, and most importantly, it provides deeper blade penetration with each and every swing. This means that you can cut up to 3 times deeper, saving time and energy…though your muscles won’t get as much of a workout! The axe has near-perfect weight distribution. What does this mean for you? Well, simply put, it means you can pack more power and punch into each swing, as each one is in alignment with your body’s balance. Kind of like when you’re swinging a baseball bat. So each swing is easier and faster. Shock-absorbing DuraFrame® handle which is lightweight and does an excellent job of absorbing shock during cutting. Hardshell sheath which helps protect the blade and you. Allows for proprietary blade-grinding which gives you a sharper edge for stronger contact and smoother cuts. Low-friction blade coating to prevent the axe from getting stuck. An insert moulded head prevents loosening and breakage due to over-strike. Designed in Finland using knowledge from 360 years of the world’s best forged tools. I found a total of 106 reviews on Amazon at the time of writing this with an average of 4.6 stars out of 5. That’s a pretty darn good rating for Amazon and it gives me confidence that this product is liked by most of the people who have purchased it. As I read through the reviews, I can see some very positive comments. Comments like, “I was drawn by its beauty,” “Now this is an axe!,” “Each chop can easily sink in 3-4 inches,” and, “My husband brought this chopping axe and absolutely loves it,” shored up my confidence in this product. There were only 2 reviews below 4 stars. One from a guy who left his purchased Fiskars axe on top of his truck and had it stolen. “I hope someone is enjoying it,” he wrote. Poor guy, so do I! And the other reviewer talked about the handle being faulty, but as another review replied and pointed out, he used it commercially for 4 years without any problems, so it must have been a one-off faulty unit. 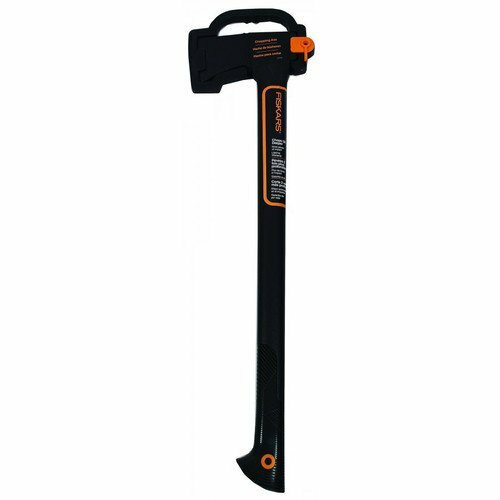 In summary, the Fiskars 28 Inch Chopping Axe seems to be a much-loved axe chosen by many Amazon users with very few complaints…unless you’re clumsy at leaving things on top of trucks, that is. Most reviewers rave about its strong steel blade and, for me, this was its main takeaway too. Faster, deeper cuts with less effort, and in less time. Isn’t that what everyone really wants in an axe?